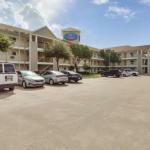 Howard Johnson Clearlake, situated off Sam Houston Toll & I-45, is a short drive from Ellington Air Field and Hobby Airport. Other nearby places of interest include Zion Lutheran, Grace Community, Clearlake Golf Club, Glenbrook Park Golf Course, Keman Boardwalk, Almeda and Babybrook Malls, NASA Space Center and downtown. Highlights of the hotel are apartment size kitchens and pet-friendly rooms. High-speed Internet, local telephone calls and parking are complimentary. Howard also provides handicap facilities for the convenience of physically challenged guests; and Express check out service. The front desk welcomes you round the clock. Each 2 Double Beds Room is equipped with a hairdryer, iron, full-kitchen, expanded cable television with HBO, CNN, TNT, MTV and ESPN, two double beds and Internet. You can choose from smoking and non-smoking rooms. For invigorating leisure, there is an outdoor swimming pool and fitness center. The hotel has an ice machine, elevator and safes for added convenience. Though hotel serves continental breakfast, there is no full-service restaurant on the property. You can cook meals and snacks in the comfort of the room and / or try nearby eateries. To keep in touch with friends and family Howard provides Internet. You can choose from seventy cable channels to spend leisure in front of the television.